Explanation: Big, bright, beautiful spiral, Messier 106 dominates this cosmic vista. The two degree wide telescopic field of view looks toward the well-trained constellation Canes Venatici, near the handle of the Big Dipper. Also known as NGC 4258, M106 is about 80,000 light-years across and 23.5 million light-years away, the largest member of the Canes II galaxy group. For a far away galaxy, the distance to M106 is well-known in part because it can be directly measured by tracking this galaxy's remarkable maser, or microwave laser emission. Very rare but naturally occuring, the maser emission is produced by water molecules in molecular clouds orbiting its active galactic nucleus. 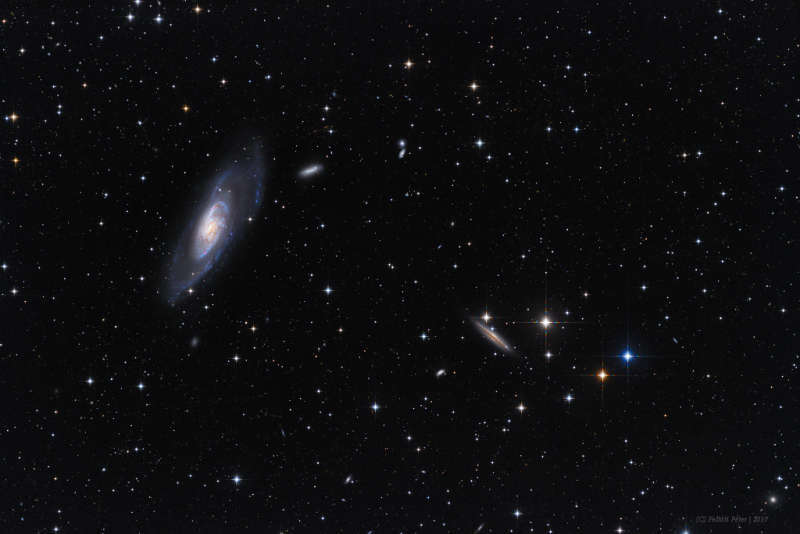 Another prominent spiral galaxy on the scene, viewed nearly edge-on, is NGC 4217 below and right of M106. The distance to NGC 4217 is much less well-known, estimated to be about 60 million light-years.